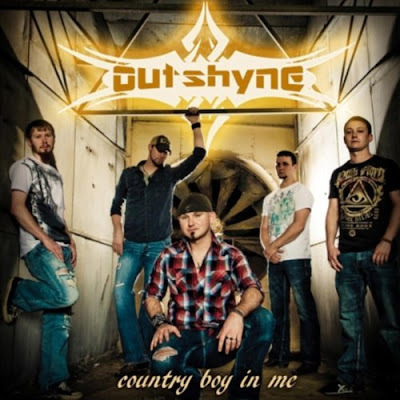 Review: Outshyne "Country Boy In Me"
Playing 180 shows in 2010 helped cement the already sterling musical marriage of five young men from Laurens, South Carolina who are doing their level best to outshine musical competitors like Reckless Kelly and the Randy Rogers Band. The band - called Outshyne - make a credible case for future Texas country stardom with their surprisingly tight 10-song album "Country Boy In Me." A ridiculously memorable track "Ought To Be A Country Song" will excite any new listener of Outshyne - such as this reviewer. The band more than exceeds expectations with excellent instrumentation and talented lead singer Waylon Owings, whose late father, Kennie, encouraged his musical pursuits. Kennie would be mighty proud of his son and his talented friends Josh Coleman, Jayson Paxton, David McCall and Matt "Smiley" Norris. Waylon Owings penned the second track "Reckless" which has a great hook and proves that the band can create solid Red Dirt music. The hard rockin' "Love To Watch Her Leave" will obviously be a crowd favorite at Outshyne concerts. The album's biggest surprise is the retro-country "Carolina Shyne" that is performed with style and soul. Traditional country radio stations would slurp this song up faster than sweet tea on a hot Charleston day. "County Jail" has much of the same charm. The aspirational "Make It Big" is performed with passion and provides pitch-perfect harmonies. This track also has radio potential. The Red Dirt title track "Country Boy In Me" is successful on all levels, and the blue-collar cut "Working My Life Away" is another musical treat from the pen of Waylon Owings. The final track "Jeans" will excite live audiences. Review: Rebecca Linda Smith "True Love"